Use code MADNESS20 at checkout to save $20 off your purchase of $100 or more! The greatest month in sports is back in just a few weeks when March Madness 2019 kicks off on March 19. The field of 68 college basketball teams will be competing for a chance to play in the coveted Final Four, which starts on Saturday, April 6. This year’s Final Four is taking place this year at U.S. Bank Stadium in Minneapolis, Minnesota. The two semifinal games will be played on Saturday, April 6, and the National Championship game will be played on Monday, April 8. For fans who have the special opportunity to follow their team to basketball glory — or who just might be in town for one of the greatest sporting events of the year — choosing the right seats for the game is an important part of the Final Four experience. Fortunately, SeatGeek has a Final Four Seating Chart guide to help with that. Home to the NFL’s Minnesota Vikings, U.S. Bank Stadium is a state-of-the-art facility that opened in 2016. The stadium hosted Super Bowl 52 in 2018, and has been the site of many major concerts and other live entertainment events. It is well-known for its ability to handle large crowds and high-profile events with ease. This is not the first basketball game that U.S. Bank Stadium will have ever hosted — there was an event with four games this past December — but this will certainly be the biggest. The stadium staff should have had the chance to work out any kinks in preparation for the roughly 70,000 fans that are expected to be in attendance for Final Four games. Some seating sections are temporary seating built just for the Final Four. That doesn’t make them bad seats — in fact, these are the better seats in some cases — but is something to be aware of. These will likely be installed on all four sides of the court, closest to the action. U.S. Bank Stadium has two large video boards at either end of the stadium (over what are usually the the endzones). However, according to this article in the Star Tribune, a giant NCAA scoreboard will be hung in the center of the stadium, as was done last year in San Antonio. This should allow fans from all angles to easily view the replay board and game statistics. Where is the best place to sit at the Final Four? At a large venue like U.S. Bank Stadium, there is a seat for every type of fan. Choosing the right seat for you depends on your preferences and budget. If you’re looking to get as close to the action as possible, there are special floor seating sections behind the baskets in sections one and two. 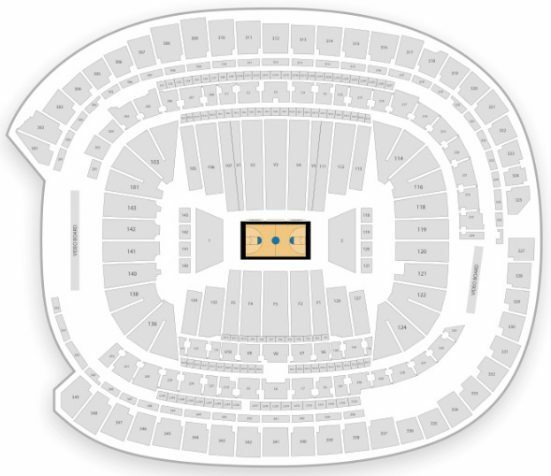 If you want the best sightlines, for basketball games, the best sightlines are almost always located in the center court or “sideline” seating sections. At U.S. Bank Stadium specifically, this includes lower level sections ranging from V1-V5 and F1-F5. For third level seating, the best sightlines are located in sections 310-314 and 340-344. For a full breakdown of the seating sections and our advice on the best seats in the house, take a look at our article about the best place to sit at this year’s Final Four. The majority of Final Four tickets will be delivered via a mobile transfer on Flash Seats this year.